The week before last saw historian Elle Larsson speaking at PubSci. The talk centred around the exotic animal trade and, in particular, the life of Charles Jamrach: a trader of animal specimens – both living and dead. Charles’ father was an entrepreneur from Hamburg who noticed that sailors were bringing back exotic animals in the hull of their ships and selling them. There was such huge interest in these peculiar beasts that sailors were able to retire from the profits. Jamrach Senior wanted a cut of the action. It soon became apparent that London was the hub of the exotic animal trade and Charles moved to London in 1840 to set up his business after the death of his father. Charles began forming a network of contacts and runners between Liverpool, Marseilles, and Bordeaux. He was soon able to boast that he could get ‘any animal except a Koala’. The relationship between Koalas and gum trees had not been fully realised at this point and three unsuccessful attempts to secure one had resulted in failure. Jamrach was forced to concede this one shortcoming. Jamrach was buying between a shilling and five pounds, depending on the specimen. 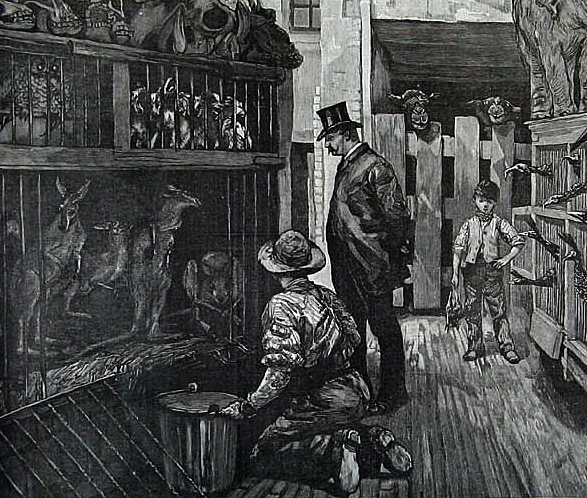 With the middle men involved it was no longer possible for a sailor to make his fortune selling exotic animals as the profit was split among too many people. Even Jamrach sometimes had to take a lower asking price for one of his animals than he had originally paid for it: He was certainly not guaranteed a better price later and the cost of keeping the animal in sellable condition was not cheap. He sold living specimens to zoos and private collectors, dead specimens to museums. Whatever these groups turned down, the taxidermists picked up. In late Victorian London there was a fashion for furniture made from animal parts. People would choose an animal (often still alive) that they wanted turned into cutlery, a chair, or piano and the poor beast would be sent to the taxidermist for production. It is hard to imagine such a situation today, though the culinary world still has a “choose live product” remnant of these bygone days. There’s one area in which Charles Jamrach reminds me of Archcancellor Ridcully, from Terry Pratchett’s Discworld – in the sense that they both did their bit for endangered species… by keeping them that way: in 1851 Jamrach acquired a quagga for the Zoological gardens. In 1883 the quagga was declared extinct in the wild. The interest in unusual wildlife had a political motive in many cases: a zoo of the British Empire showcasing species from elsewhere was not just introducing the public to animals they had never heard of, it was showing the dominion that man had over the animal and the empire had over the animals’ home land. On one occasion a bengal tiger managed to back out of a poorly made transport crate and run off down the road – grabbing hold of a young boy. Jamrach managed to subdue the tiger with his truncheon but the boy’s parents still, understandably, sued. Jamrach was now famous: not only was he bringing back animals that represented empiric might, he now personally symbolised Britain beating down the tiger, symbol of rebellion against it. Not everyone was a fan of Jamrach: awareness of animal welfare was in its infancy but this was the generation that saw it develop – the RSPCA was formed during the late Victorian era during Jamrach’s lifetime and he received a good deal of complaints abou the way his animals were treated. Complaints about Jamrach centred around the cramped transport conditions, stressed overcrowding of predators near their prey, and the malnourished states they reached London in. This was a time when the accepted wisdom for “reforming” a vicious and malnourished crocodile was to tie it down and force feed it. It is unclear whether Jamrach participated in this but he escaped criticism by dying in 1891 – the year that the practice was challenged. He left a vast sum of £7108 inheritance to his son: the equivalent of half a million pounds in today’s money. To learn more about Elle Larsson’s research, visit the animal history museum – an online exhibition about the trade.